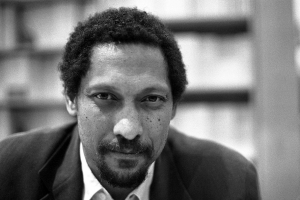 SHREVEPORT, LA — Novelist Percival Everett will be the 28th recipient of Centenary’s John William Corrington Award for Literary Excellence. Everett will receive the award during a ceremony on Monday, October 2 at 7:00 p.m. in the Whited Room at Centenary’s Bynum Commons. Everett will give a reading during the award ceremony, and the event is free and open to the public. Everett is Distinguished Professor of English at the University of Southern California and is the author of more than 30 books, three collections of short fiction, and one book of poetry. He is a past recipient of the Academy Award from the American Academy of Arts and Letters, the Hurston/Wright Legacy Award, and the 2006 PEN USA Center Award for Fiction. Many Centenary students will be reading various works by Everett this semester, including his collection of short stories, Half an Inch of Water, and his newest novel, So Much Blue. In addition to receiving the Corrington Award, Everett will be visiting classes and speaking with students on October 2 and 3. The John William Corrington Award for Literary Excellence is presented annually by the Department of English at Centenary on behalf of the Centenary student body and faculty to an established, critically-acknowledged writer. The award honors a Centenary alumnus and English major, Bill Corrington (1932-1988), who was variously an English professor, an attorney in private practice, and, with his wife, Joyce, the head writer for several television series, including Search for Tomorrow and General Hospital. A prolific poet, he also published four novels, two short novels, and three collections of short stories. In 1991 Eudora Welty became the first recipient of the Corrington Award when she read her short story "A Worn Path" at Centenary's spring Commencement. The Award takes the form of a bronze medal designed by the internationally-exhibited Louisiana sculptor Clyde Connell. The medal depicts two primitive figures, one of them slightly in front of the other, carrying a long object. A presentation box, hand-made by a local craftsperson, accompanies the medal. For more information on the Corrington Award and a full list of past winners, visit centenary.edu/corrington.